When grinding hard concrete the bond of your diamond segments should normally match the concrete hardness in the opposite way, eg. soft bond for hard concrete and hard bond for soft concrete. To make a diamond segment the diamonds are mixed with metal powders in a mold and put into a furnace and under pressure where the metal is made into a block. The “bond” is the metal matrix of the block into which the diamonds are embedded. These blocks, more commonly called diamond segments are then welded onto a metal plate to form a grinding wheel. Exposed diamonds on diamond segments form rocket trails where the front of the rocket trail is the exposed diamond and the trail behind it is the metal bond that has not been worn away. Polished or flattened segments do not have rocket trails. When grinding concrete the diamonds cut into it and scratch it away as long as the diamonds are exposed like the above image (see the rocket trails). This breaks the concrete down to sands and dust. 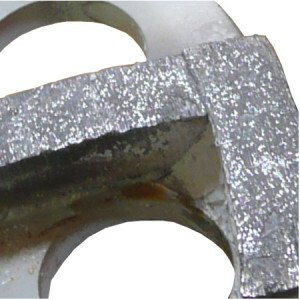 During this process the diamonds fracture and wear down, but at the same time the bond metal is worn away by the sands of the concrete which exposes more of the embedded diamonds so that cutting can continue. When grinding hard concrete the hard concrete does not produce much sand. The diamonds cut, blunt and break as normal, but the metal bond surrounding them is not worn away easily without the sand so the diamonds do not become exposed as much as with medium hardness or soft concrete. This is when the diamond segment stops working and rubs on the floor instead of cutting into it because the diamonds have worn down to the metal, but the metal matrix is not wearing away to expose new diamonds. The diamond block is then flattened, polished and becomes very hot with continued use. 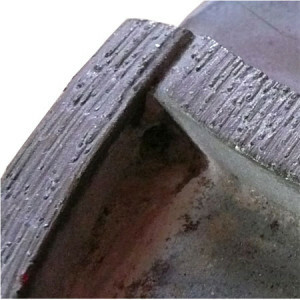 At this stage of grinding hard concrete you need to press very hard and stay in the same spot longer for the cupwheel to grind any concrete which causes the temperature of the diamond segments to rise rapidly which can turn the metal blue and cause the diamond wheel to buckle and jump around instead of grinding smoothly. Wetting the concrete before concrete grinding helps to expose the diamonds a little more. Try to scratch open the surface first, then apply water and give it a couple of minutes to soak in. Broom off the puddles and remaining water to leave the surface wet. This process makes the dust a little heavier which cuts the matrix more to expose more diamonds. The dust will appear to be the same as if the water has done nothing , but grinding will be more productive. Repeat this process for each new cut. What makes concrete hard to grind? 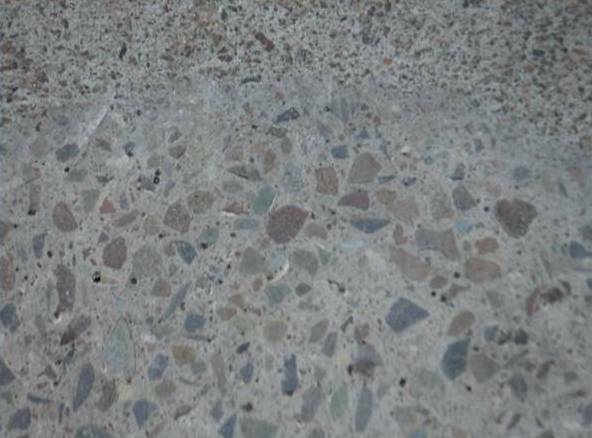 This is the million dollar question, but two main things contribute to concrete hardness – the ratio of cement & water in the mix which determines the hardness of the the concrete paste and the type of aggregate used. Hard concrete means a hard paste (the grey matter that we recognize as concrete). Hard aggregate means the hardness of the stones used in the concrete mix of which there are very hard ones and quite soft ones used depending on the local supply. The unexpected variation comes when you have medium strength concrete (with very hard aggregate) which you grind easily at first, but as you get into the aggregate your speed slows down dramatically because there is possibly only 35% concrete paste now and 65% aggregate which may be considerably harder than the concrete. So then you may have to change to a softer bond diamond segment than the one you started with. 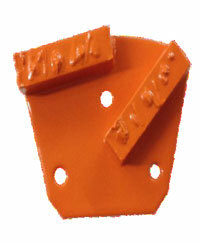 Generally speaking you use a larger diamond grit (low number) for faster removal of concrete and for harder concrete. Because larger diamond grits are more aggressive they are not as smooth to grind with which you will notice at 30/40 grit and larger. For polished concrete you start concrete grinding with a coarse diamond and approximately double the grit number (halve the diamond size) with each new pass until the floor is polished which may take several steps. ie. 30/40, 50/60, 80/100, 200, 400, 800, 1500 and then 3000. For example, with Situp N Grind concrete grinder use 30/40+60/80 for the first two cuts. We recommend our Situp Polisher when you change to 100/80 fine for third cut using soft bond segments for hard concrete. The concrete will not be polished but it will be very smooth, ready for resin bond pads to complete the polishing work using low speed hand grinders. Note that the Situp Grinder kit fitted to a 9 in (230mm) angle grinder runs too fast for diamond resin bond pads, and grits above 80 mesh will quickly heat up the segments if the concrete is medium to hard strength. If the concrete was hard you would normally need to use a slow speed grinder or grind it wet. After using the fine cupwheel you can get a polished concrete look by applying a couple of coats of clear urethane or clear epoxy without the need to actually polish the surface. In between the grinding it will be necessary to fill in the thousands of tiny holes in the concrete to stop bubbles and holes appearing in you final coat.